The add-in does exactly what its name suggests: counts words and characters in Excel. You can calculate all symbols or words in a cell as well as find out the number of specific letters. The results can be returned as values or reusable formulas. Count all characters in Excel Return the number of symbols in each cell of the selected range. Get a word count in Excel Find out the number of words in each cell within a certain range. Count specific characters in selected cells Check how many times a particular char appears in your dataset. Insert the result as value or formula Have the results as static numbers or updatable formulas. What is Count Characters and what do I need it for? 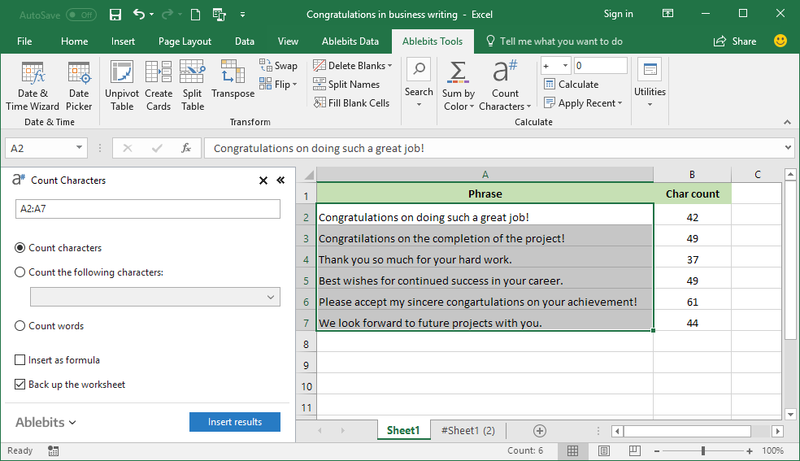 The Count Characters add-in allows you to count the number of characters and words in Excel cells. You can either get the total char count in selected cells or tally the occurrences of a specific symbol. The tool lets you insert the result as a number or formula. Can't I count number of characters in Excel without any add-ins? Yes, you can. It's probably no big deal to count all characters in a cell by using a LEN formula. To do a word count in Excel, be prepared to build a more elaborate formula by combining various functions like LEN, TRIM, and SUBSTITUTE. Counting specific characters could be even trickier. With the Count Characters tool, the number of your actions is reduced to a couple of mouse clicks. How to count characters and words in Excel? Click the Count Characters icon under the Ablebits Tools tab. Choose what you need to count: characters, specific symbols, or words. Decide if you want the result as a formula and whether you need a backup worksheet. I need the result as a formula, can the add-in do that? Yes. 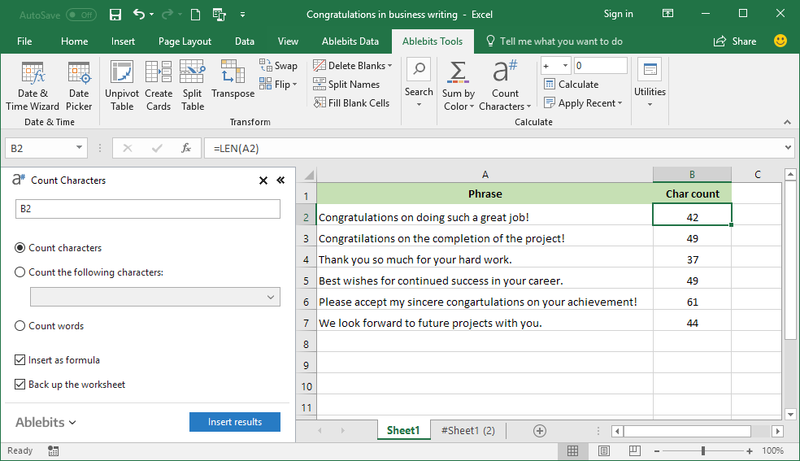 The add-in inserts a simple LEN formula for a char count and a more complex formula for word count. Where does the add-in put the results? Count Characters inserts a new column to the right of your selected range and places the result next to each cell with the original data.